The Rosarian Academy school-level competition of the 2019 National Spelling Bee was held on January 11, 2019. Twelve fifth-through-eighth-grade students competed in the Bee. 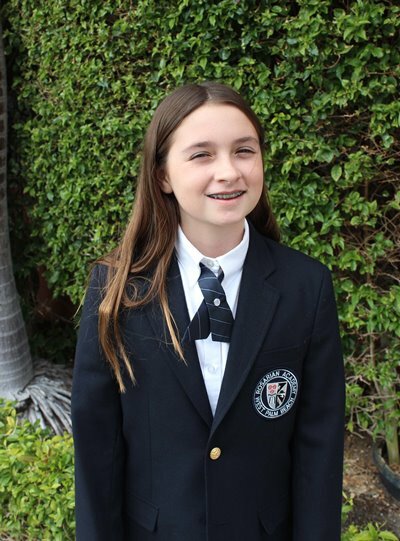 After 16 rounds, Emma Chopin (sixth grade) won with the champion word “deliberately.” Nicholas Grippi, also a sixth-grade student, was the runner-up. Emma and Nicholas were the two school-level finalists in 2018 as well. They will both represent Rosarian at the Final Regional Southeastern Florida Scripps Spelling Bee on Thursday, March 7, 2019, at The Benjamin School. The other Spelling Bee participants included: grade 5—Ella Ross Lang, Charlotte Jordan, Heidi Alcime; grade 6—Risa Hernandez; grade 7—Juan Lucas Gonzalez, Harry Scarola, Tucker Yavinsky; grade 8— MJ Hanlon, Ava Iuliani, Victoria Reynolds.